Three years ago when I started online shopping for Korean makeup and skin care products. Since then, it has been part of my day and night beauty regimen. I used to have a dull skin until I found the best moisturizer for me dry skin. It's not an overnight thing especially when if are suffering from problematic skin - acne, large pores and discoloration. But there's hope in treating early signs of skin aging. We can easily spot dehydration, allergies and even stress just looking at the skin. Too bad that we are surrounded with factors that causes these stress to our skin. These are pollution, stress at work and school, sweets that often times we cannot resist, lack of sleep and diet. The good news is that we can prevent early signs of aging such as wrinkles, dark spots and dry skin by eating a balance diet, drinking lots of fluids at least 8 glasses of water. A quick visit to the spa or skin care clinic for the much needed facial treatment and body scrub won't hurt. Of course, religiously following skin care regimen. At first, I thought I couldn't make it because I'm too busy but cleansing the face especially at night before going to bed becomes a habit. Back then, I'm afraid to use a toner then I realised and even seen how toner works on lengthening the skin and preventing the pores becoming too large. Last night, I discovered another product to add in my skin care routine. 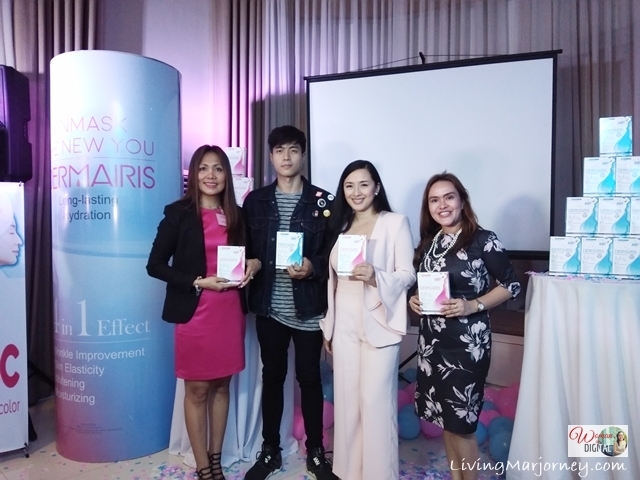 JWHP unmasks its latest product called Dermairis Facial Masks. Ms. Glenda Arceno, General Manager of JW Healthcare Phil. said "Beautiful Skin requires commitment, not a miracle." and I truly believe in her. In order to achieve a flawlessly radiant skin, we have to take care of it inside and out. We were enlighten by the talk of Dra. 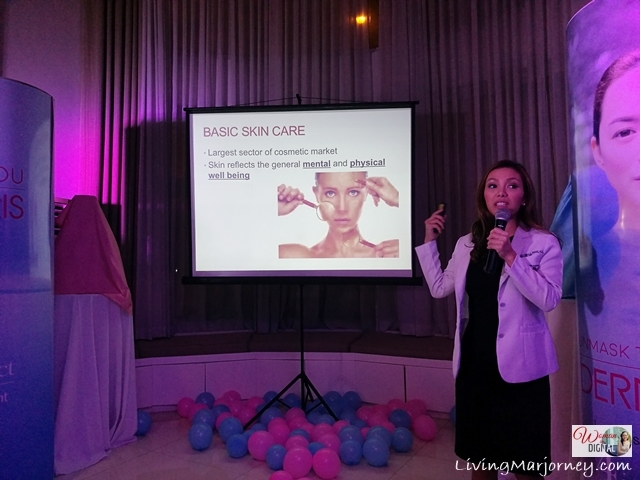 Crystal Roxas as she discussed proper skin care. Dermairis Mask stands out even against other cosmeceuticals with its patented JW-EGF (CTP-EGF) and AMF (Artificial Moisturizing Factor) technologies. EGF or Epridermal Growth Factor is an essential part of skin regeneration. It attracts cells to skin trauma to begin the repair process. JW's Dermairis Mask works 5x faster than EGC, making the Dermairis Mask more effective than other brands. 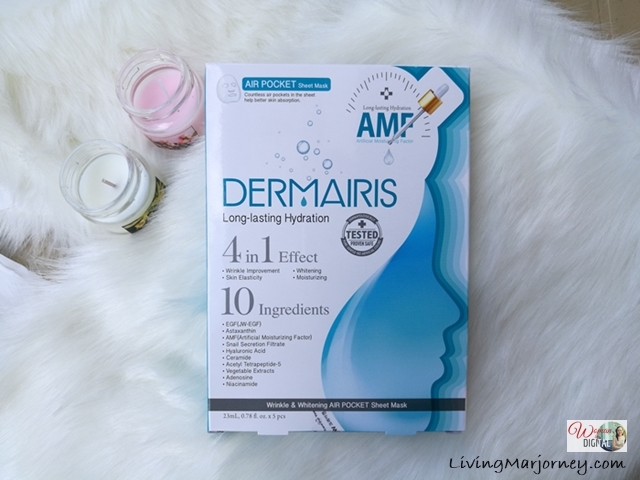 Dermairis Mask is available in 2 variants. The Dermairis Blue variant consists of air pockets that contain nutrients. It will be available for only P70. 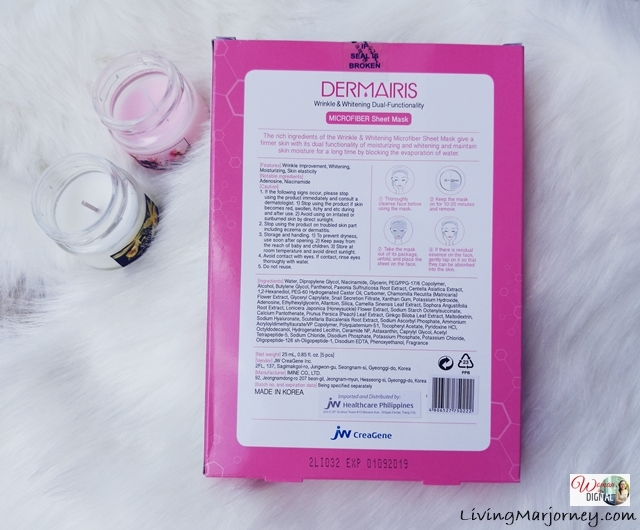 While the Dermairis Pink has soft microfiber that is finer than the hair strand. It will be available at P150. You will see them in pink and blue pack of 10 sheets. Each package contains high-density and water-soluble sheets that uses 10 main ingredients. Recommended use is twice a week. You will see the effect after 4 weeks of continuous use. 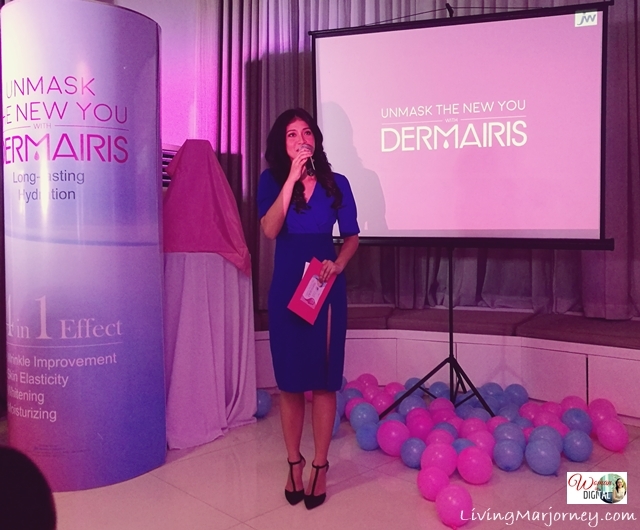 Dermairis will be available at leading beauty and wellness counters, drugstores and skin clinic nationwide. 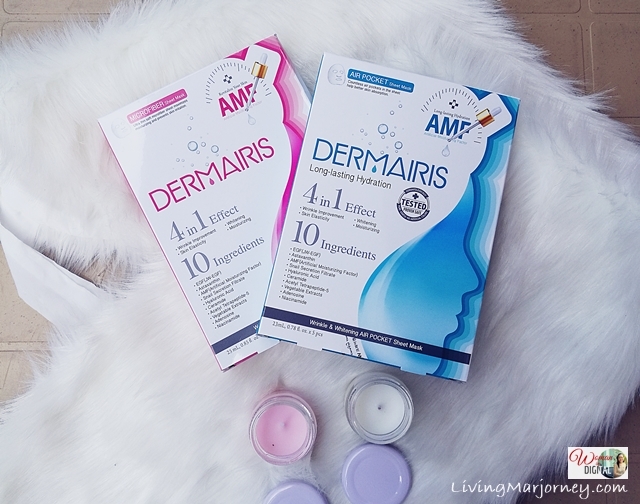 Stay tuned for my review of Dermairis Pink and Blue variants.